Sample data is entered in the field using pre-defined methods and uploaded directly into your LIMS. EnviroChain streamlines sample login and reduces costs with LIMS integration. With sample submission from the field and LIMS integration, login data entry is dramatically reduced and transcription errors are eliminated, saving time and improving accuracy. Compared with the typical cost of processing a paper CoC in the laboratory of around $10.00, EnviroChain reduces that expense by 80% or more with a transaction cost of under $1.00 and very little data entry. EnviroChain is a subscription service for laboratories, and starts with a FREE six month trial. Laboratories simply register for EnviroChain, build a profile, and provide a link to clients (sample generators). Sample Generators pay no fee to submit samples. Just register, select the lab and project, and submit samples. EnviroChain is integrated with Element LIMS from Promium or can be integrated with other LIMS. See our API Information for more detail. EnviroChain features and functionality are developed specifically for organizations that perform or require testing of water, soil, air, cannabis, and food. 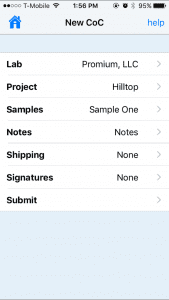 Sample information submitted directly from the field and imported to your LIMS. Create and securely share a CoC with others in the organization. Upload your methods and containers to customize what you clients will see. Save time by copying an existing CoC or just copy individual samples. Step-by-step workflow process makes it easy for field team. Use pre-entered analysis to save time and eliminate errors. Subscriber model includes data integration with your LIMS. Non-Subscriber model includes CoC images. Select the laboratory to which you will submit the CoC. Then select the laboratory contact. Select the appropriate project from a list of pre-loaded options. 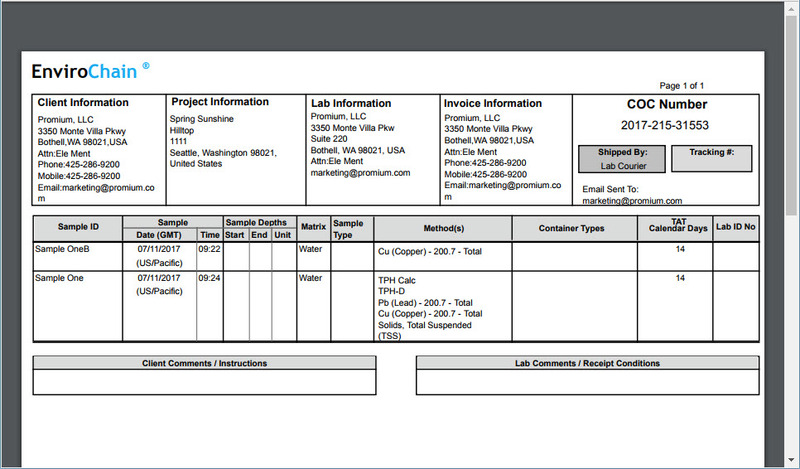 Add sample ID, and then select matrix, analyses, containers, and turnaround time from the menu. Print the labels and label bottles if appropriate. At this point, you can “share” the CoC with the field samples for them to complete the process. In the field, select the CoC to edit. Edit the CoC as required. 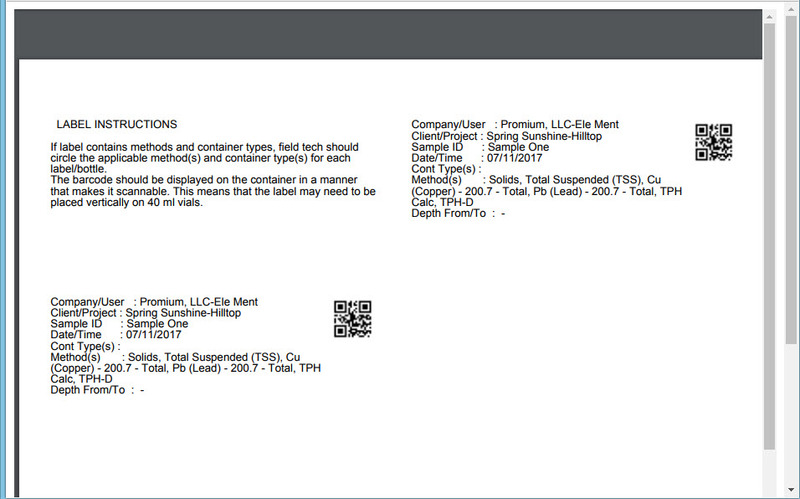 If appropriate, add depth, container type, GPS, a photo of the site, sample type, and field data. Select the shipping method for this particular delivery. Add your signature to the CoC record. Submit the completed CoC to the laboratory. View an online or PDF copy of your CoC. View short video of EnviroChain functionality. Get a live demonstration of EnviroChain. 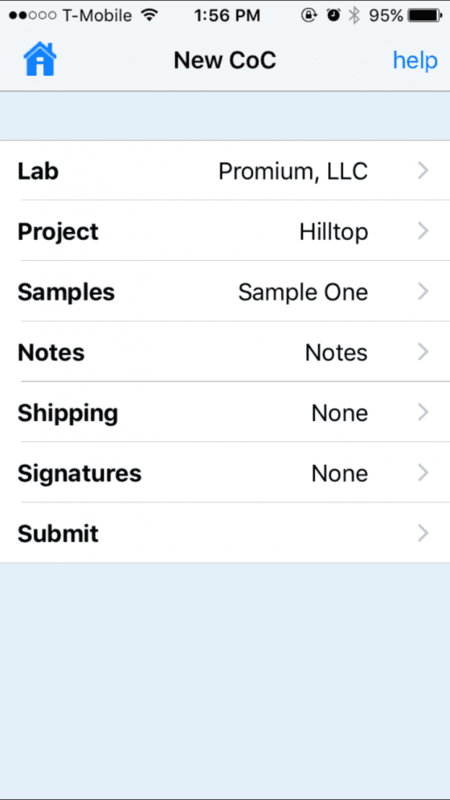 Submit samples directly from the field. FAQs, articles, User Guides, API Download, and Custody Seal. "The best part is that I know the lab is instantly getting my information. It’s all automatically uploaded." Configurable laboratory information management system designed exclusively for laboratories that test air, soil, water, and food. Give your clients direct access to final results data with an upload to DataConcourse for analysis, formatting, and reporting.